Izac Rauh and Cameron Franck were the two Darke County boys who earned Eagle Scout ranking recently in St. Henry. 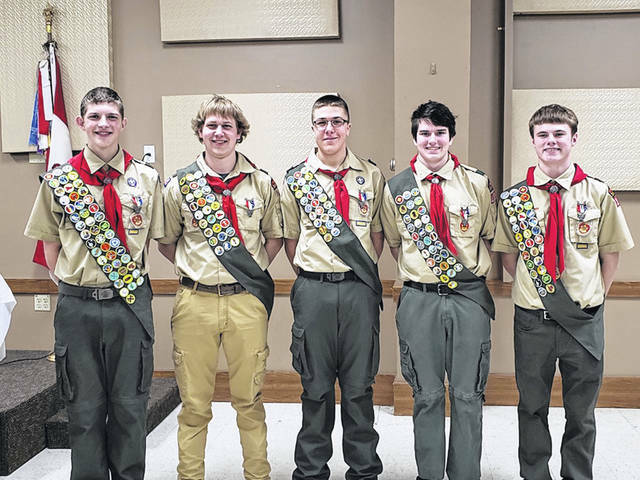 ST. HENRY – Two Darke County boys were among five who were honored for their Eagle Scout distinction on March 10 at the St. Henry American Legion. Among the five were Izac Rauh, son of Angie and Chris Rauh of New Weston, and Cameron Franck, son of Nikki and Ted Franck of Burkettsville. Rauh is 16 and a sophomore and Franck is 18 and a senior at St. Henry High School. Rauh’s project that helped him earn the Eagle award was his restoration of 24 lounge chairs, which were weathered and worn out from daily use for the St. Henry Community Pool. This project required 298 hours of labor, with Rauh, along with several volunteers, which consisted of family, friends and a couple of his fellow troop members. It was noted they worked hard to reach the deadline for opening day of the new pool so that the community can enjoy sitting poolside and relaxing while watching their families at the pool. Franck’s project was building a new picnic table for the Fort Recovery Gun Club. The tables were falling apart. After several hours of planning, Franck and his volunteers built the new tables for all of the club members and their families to be able to enjoy sitting around the tables and eating outside. Rauh has a cousin, Eric Rauh, who is an Eagle Scout while Franck is the first Eagle Scout in the family and close extended family. Rauh, who has a younger sister, Rylee, and a younger brother, Owin, is the grandson of Jim and Susan Kammer of Ansonia and Dave and Linda Rauh of Burkettsville. Franck, who has a younger sister, Hailey, and a younger brother, Riley, is the grandson of Paul and Carol Mertz of Burkettsville and Jean Franck and the Late Bill Franck of Portland, Indiana. The other three boys who earned Eagle Scout honors were TJ. Burrows, Luke Ontrop and Nathan Howe, all of whom belong to St. Henry Troop 101. Burrows and Ontrop attend Coldwater High School and Howe attends St. Henry High School. All five boys also were honored at the Black Swamp Council District Dinner earlier this year, where they all received an Eagle Scout Medallion. Rauh, Franck, Howe and Ontrop traveled to Lima on March 16 to the Black Swamp Council Dinner where they were all honored and recognized on stage with 40 other fellow Eagle Scouts from other surrounding communities as the 2018 Class of Eagle Scouts. There were more than 52,000 scouts that earned their Eagle Scout Award around the world in 2018. Their Scoutmaster, Erik Eyink of St. Henry, has been troop leader for 13 years and now has 23 Eagle Scouts that he has helped receive this honor. https://www.dailyadvocate.com/wp-content/uploads/sites/34/2019/04/web1_Boy-Scouts-Eagle-Awards.jpgIzac Rauh and Cameron Franck were the two Darke County boys who earned Eagle Scout ranking recently in St. Henry. This entry was tagged Boy Scouts, Burkettsville, Eagle Scouts, Fort Recovery Gun Club, New Weston, Scouts, St. Henry, St. Henry American Legion, St. Henry Community Pool. Bookmark the permalink.